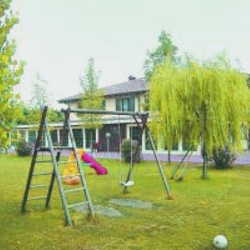 The farmhouse is in a large space in the countryside with a small lake for fishing available for the guests. Customers can buy local products in a small store: fruits and vegetable from integrated pest management productions, DOC and IGT wines, jams and marmalades, DOP potatoes, liqueurs and other specialties. Recognized by the DegustiBO brand, the farmhouse ensures that there are seasonal menus composed exclusively of specialties from Bologna, prepared mainly using ingredients of own production or local and regional.